Chanukah, the Jewish festival of lights, is at its halfway point – Wednesday marks the 4th night of 8. The holiday is traditionally marked by lighting candles (an extra one each night), eating foods fried in oil and exchanging gifts. If you are full of doughnuts and cannot look at another latke, TMO has found a few apps to help you keep celebrating the holiday. This rather sweet app and is available on Mac and iOS. 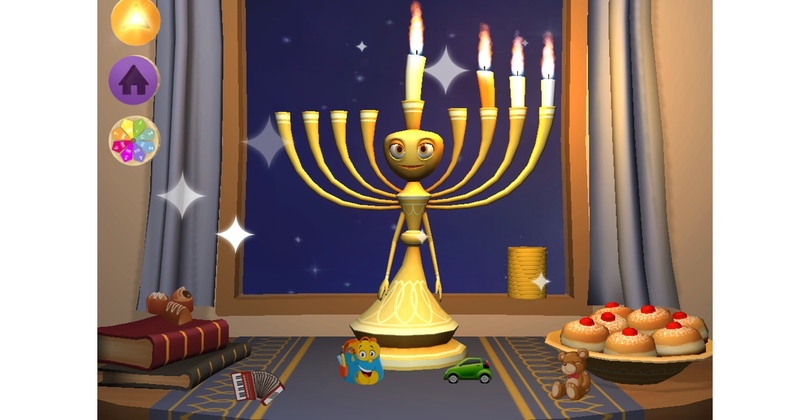 My Menorah talks children through which day of Chanukah it is, allows them to spin a digital dreidel and pick their candles for the menorah (the 9-branched candelabra that is lit each night.) It also teaches the colors in Hebrew. This iOS app also helps keep track of which day of the festival it is. It tells you how many candles to light and which order to light them in. It also provides the Chanukah prayers in Hebrew, English and Transliterated form. Dreidel is a traditional game played at Chanukah. The dreidel itself a bit like a spinning top combined with a dice. 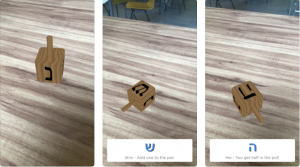 If you cannot get your hands on one, iGevalt has an AR version for iOS. Hover it over a surface and spin away! This iOS app is fairly self-explanatory. 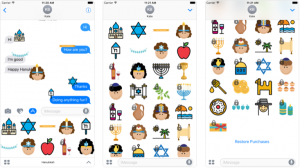 It provides a whole array of Chanukah themed digital stickers to send to friends and family during the holiday!